The cloud-based security provider slipped on a valuation-based correction. 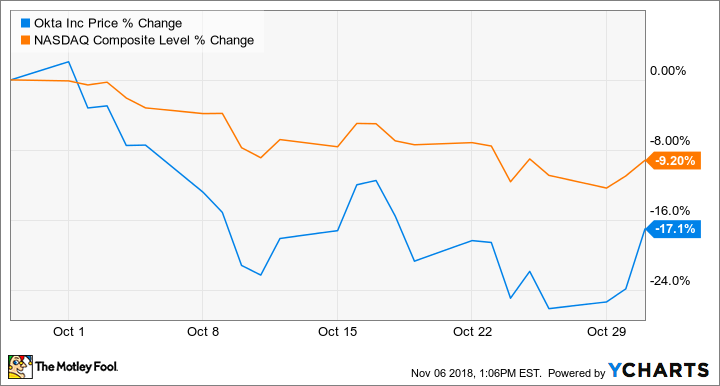 Shares of Okta (NASDAQ:OKTA) were sliding last month as the cloud-based security specialist was swept up in the broader sell-off of high-priced tech stocks in October. According to data from S&P Global Market Intelligence, the stock finished October down 17%. As the chart below shows, Okta's slide essentially tracked with the Nasdaq, which lost 9% last month. There was little company-specific news out on Okta during October. But the stock seemed to come under pressure due to valuation concerns as investors backed away from growth stocks due to rising interest rates -- which have cooled off the stock market in general, and high-flying tech stocks in particular. Before its sell-off last month, Okta had nearly tripled year to date as the company has consistently beat its own guidance and analyst expectations. The company has made itself the independent leader in "identity as a service" for the enterprise, allowing easy and secure access and connectivity for companies and their employees and customers. But Okta's stock surge this year has seriously inflated its valuation, as the company is not profitable. And even after last month's slide, it still trades at a price-to-sales ratio of 19, more expensive than almost any other stock on the market. Okta's earnings report is due out in about a month. The company is projecting revenue growth of 43% to 45% -- to a range of $96 million to $97 million -- and an adjusted loss per share of -$0.12 to -$0.11. Management also said it's targeting break-even cash flow by the end of the year. With a market cap around $6 billion, high expectations are still baked into Okta shares, and investors seem to be expecting the company to outperform its own estimates at this point. If that streak ends or if tech stocks resume their slide, Okta could take another hit.